Get the most out of your triceps exercises by using proper form. If you’re slaving away with triceps exercises but can still see that underarm jiggle, you may need to look at the quality of your form. It’s the quality of strength training that really influences your progress rather than the quantity. Understanding the proper form and mechanics of triceps exercises can transform your underarms from flabby to toned in no time at all. The muscles of the triceps are on the back of your upper arms. Three different groups of muscles make up the triceps: the triceps brachii, the brachialis and the pronator teres. The function of the triceps brachii is to extend the elbow. The brachialis flexes the elbow, and the pronator teres flexes the elbow and also aids in the rotation of the forearm. Your spine is easily prone to injury, and to prevent this during your triceps exercises you need to factor in proper back alignment. When performing standing or sitting triceps exercises, such as triceps pushdowns or triceps extensions, push your chest out and up and pull the blades of your shoulders together, recommends certified fitness trainer Jeremy Likness. Your lower back should remain slightly concave as well. You may have wasted a workout without even knowing it. The easiest way to do this is by cheating with your triceps exercises. It’s important to complete each exercise using the full range of motion required by your triceps muscles. The elbows tend to sway outward during triceps exercises, which will inhibit your range of motion. Keep your elbows close to your body and in line. This helps to isolate the muscles. When using the right amount of weight and the right form, you tend to tire during strength training, which is what you want. What you don't want is to shorten your movements because you’re fatigued. Instead, stop your exercises and choose a lighter weight to finish the exercise so you don’t sacrifice your range of motion or form during the workout. Rushing through your triceps exercises is a common mistake. If you’re able to rush your exercises, you may not be using enough weight. With each exercise aim to complete one to two sets with eight to 12 reps per set. If you can’t maintain proper form during your last rep, you’re using too much weight, and if you breeze through the last rep, you need to increase the weight. 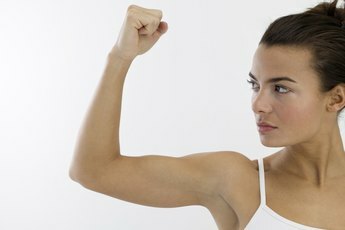 The triceps are typically people's weakest upper-arm muscle group, according to "Muscle & Strength." It’s important to train these muscles to avoid muscle imbalances in the upper body. The American Council on Exercise enlisted a group of exercise scientists from the University of Wisconsin-La Crosse Exercise and Health program to find which exercises were best at creating targeted muscle activity in the triceps. The triceps exercises used during the study were triangle pushups, kickbacks, dips, overhead extensions, rope pushdowns, bar pushdowns, lying barbell extensions and closed-grip bench presses. The results showed that the most effective exercise for targeting the triceps was the triangle pushup, followed by the triceps kickback and dip exercises. Incorporate these three into your weekly routine. 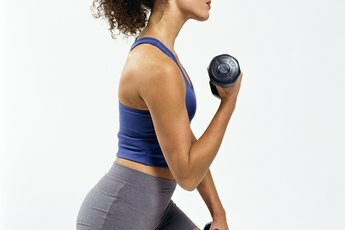 What Is the Difference Between Full Range of Motion in Exercises & Half Motion?